On Saturday morning, exactly 45 minutes after the sun began to rise over the Mojave Desert, the largest airplane ever created—and its record-breaking 385-foot wingspan—took off for the very first time. The aircraft, from the company Stratolaunch, has been eight years in the making. By 2022, the company hopes to use the twin-fuselage, six-engined, catamaran-style aircraft to launch satellite-bearing rockets into space. 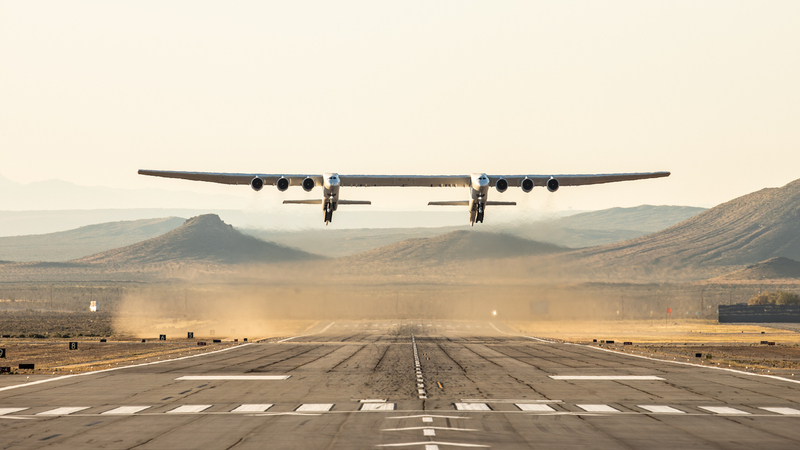 “All of you have been very patient and very tolerant over the years waiting for us to get this big bird off the ground, and we finally did it,” Stratolaunch CEO Jean Floyd told reporters on a press call. The company reported the airplane hit speeds of 189mph and heights of 17,000-feet during its 150-minute test flight, before landing safely at the Mojave Air and Space Port.